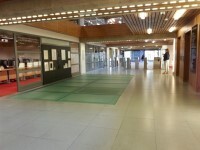 Services / facilities within the building include the library, a cafe and the AccessAbility Centre. 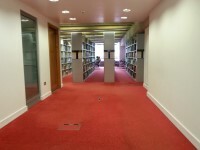 For full details on the library opening hours, please see the University website. 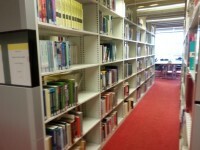 Opening times vary depending on the time of year and exams taking place. 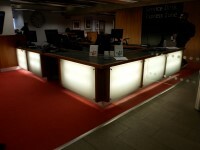 Please see the university website for more opening times information. 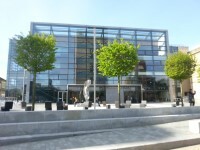 The University Campus is located to the south of Leicester City Centre, accessed via University Road. This leads off London Road (A6) and Welford Road (A5199), both of which lead south off of the Inner Ring Road (A594). 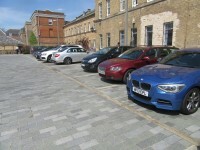 Parking on campus is very limited, but there are several public car parks nearby. Bus routes 47, 47a, 48, 48a, 80 and 80a stop on University Road, close to this building. 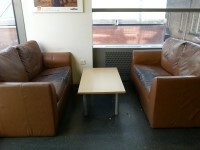 Leicester Station is located on the south side of the City Centre, just off the Inner Ring Road. University Road can be reached from here using the 48 or 80 bus. Leicester is on the London - Sheffield and the Birmingham - Stansted lines. 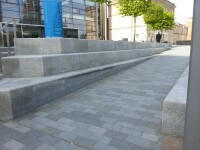 For more information about getting to the Campus, please see the Getting To Leicester page on the University website. 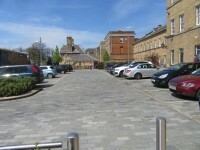 You are on Site/Campus Car Park (VIP Parking). Skip to the next section. 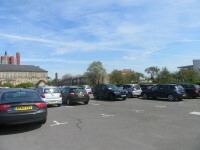 The car park is located off University Road. The nearest building(s) to this car park is/are Fielding Johnson Building South Wing. 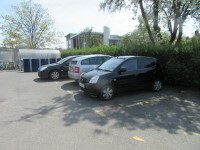 This car park can be used by visitors. 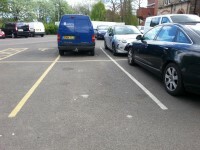 There is sloped access to the car park from the sides of the car park. This car park is clearly signposted from the University Road. 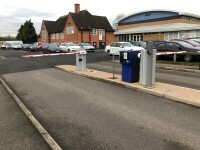 This car park is accessed via Entrance 1. 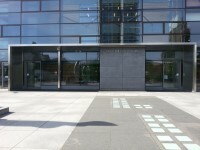 There is a barrier to access the campus at Entrance 1 (shown in photographs 5 and 6). 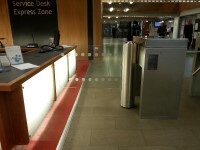 Visitors wishing to access the campus at this entrance need to press a button on the barrier to talk to security. 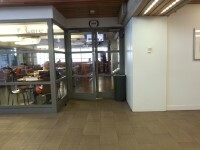 UCard holders can access the campus at this entrance by card reader. This button to the intercom and the card reader can be reached from a vehicle. 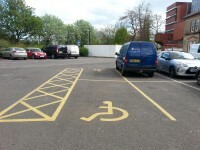 Access to this car park is by barrier (shown in photograph 1). 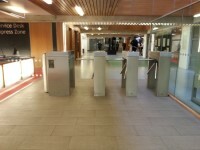 The barrier is operated by swipe card. 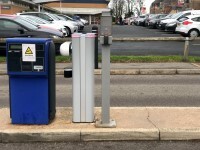 The card reader can be reached from a vehicle. 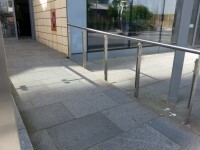 Pedestrian access is gained to the car park via drop curbs. 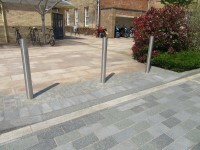 There are bollards at these drop curbs with widths of 142cm between them. 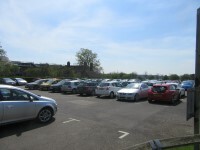 You are on Site/Campus Car Park (Visitor Parking). Skip to the next section. 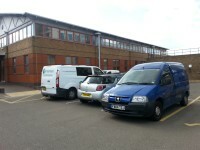 The nearest building(s) to this car park is/are Danielle Brown Sports Centre, David Wilson Library. 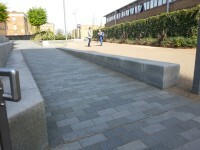 There is sloped access to the car park from the entrance road. This car park is clearly signposted from the entrance road. This car park requires a permit. Permits must be applied for in advance and displayed otherwise a penalty notice will be issued. A Permit only gives a right to search for a space. 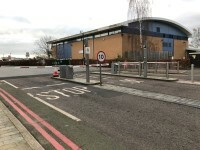 This car park has a barrier at the entrance (shown in photographs 7 and 8). 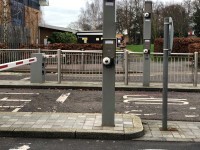 Visitors wishing to access the car park need to press a button on the barrier to gain access. This button to the intercom can be reached from a vehicle. 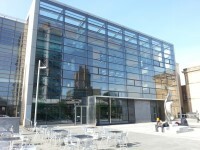 You are on Site/Campus Car Park (Attenborough Building, College House ,Computer Sciences and David wilson Library). Skip to the next section. 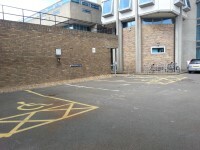 The car park is located to the rear of the Attenborough Building, next to College House. 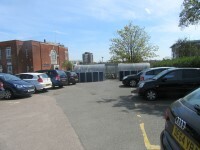 The nearest building(s) to this car park is/are the Attenborough Building. 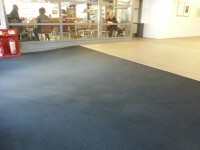 The dimensions of the designated parking bay(s) are 386cm x 530cm (12ft 8in x 17ft 5in). 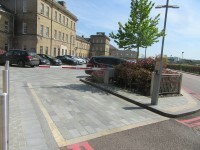 There is ramped access to the car park from the the David Wilson Library. This car park is not clearly signposted from the David Wilson Library. The nearest designated bay is 59m (64yd 1ft) from the main entrance. 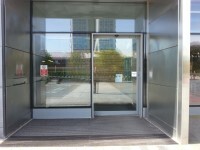 The width of the door opening is 208cm (6ft 10in). 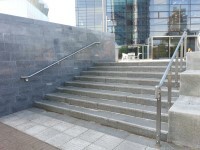 The ramp/slope is located on the pathway leading to the entrance, and also between the two sets of doors. 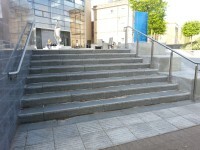 The step(s) is / are located to the left of the ramp. 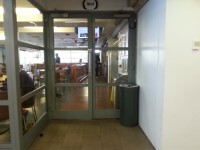 There is a third slope just beyond the second set of doors (shown in photographs 8 and 9). The third slope is moderate. 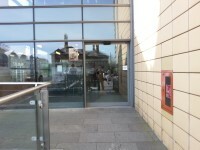 You are on Outside Access (Cafe - Terrace Entrance). Skip to the next section. 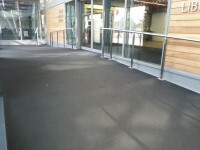 The width of the ramp is 120cm (3ft 11in). 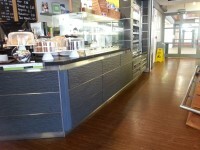 You are on Entrance (Cafe - Foyer Entrance). Skip to the next section. This information is for the entrance located to the left as you enter via the main entrance. 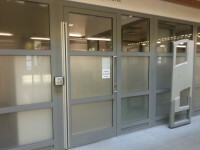 You are on Entrance (AccessAbility Centre). Skip to the next section. 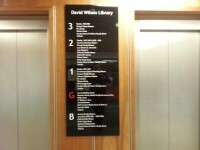 This information is for the entrance located at the front right of the library concourse. 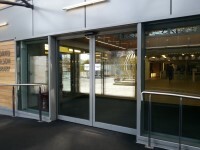 The automatic door(s) is / are push pad activated. 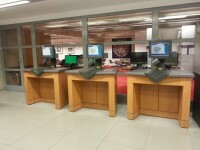 There are 3 turnstyles leading into the library by the reception desk. The width of the turnstyles is 57cm. 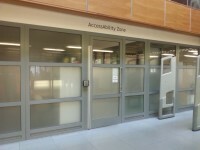 There is also a glass gate that can be swiped open by disabled users or opened by library staff at reception. The gate width is 97cm. 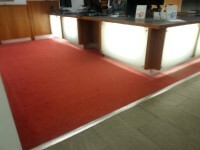 There is an easy slope, with no handrails, for access to the front area of the reception desk. 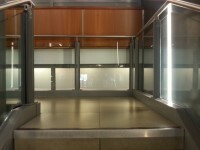 The reception ramp is shown in photographs 1 and 2. There is clearly written, tactile and pictorial directional signage at key points of circulation routes. 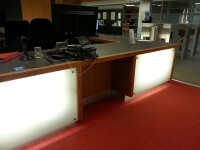 There is a fixed hearing loop at the main reception desk. 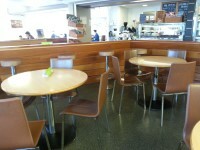 The nearest table is 2m (2yd 7in) from the cafe entrance. 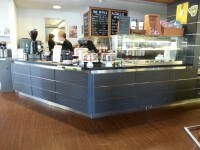 The type of food served here is hot and cold drinks and snacks. 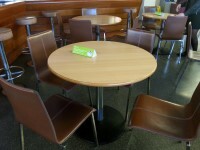 A height adjustable table is / are available. Equipment available for people with a visual impairment includes text enlargers. 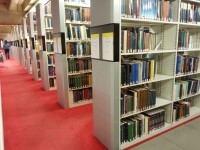 Ordering requests for books and journals in Braille/Large Print / Audio materials are managed by AccessAbility for students and via the library for academic staff. Content can be supplied, so far as reasonably practical, to meet the specific requirements of the person making the request. 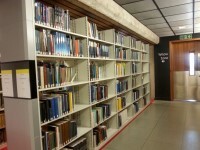 There are 3 self service book issue machines located on the left in the main foyer on the ground floor to the rear of the building (as shown in photograph 4). 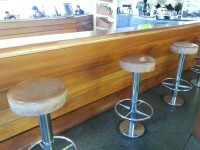 The height to the top of the counter is 92cm. The height to the top of the screen is 149cm. 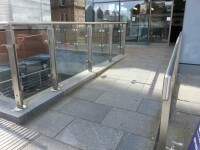 The stairs are located in the main foyer at the rear of the building. 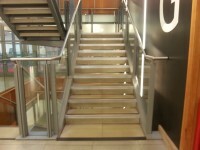 The stairs are approximately 28m from the main entrance. 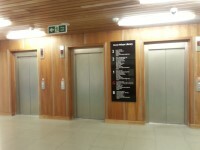 The lift is located on the left past the reception desk. 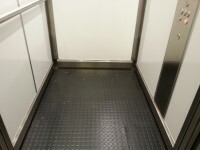 The floors which are accessible by this lift are B-G-1-2-3. 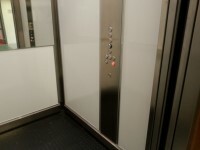 There is a bank of 3 identical lifts. You are on Accessible Toilet (Cafe). Skip to the next section. 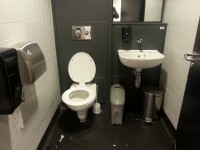 This accessible toilet is approximately 7m (7yd 1ft) from the cafe foyer entrance. 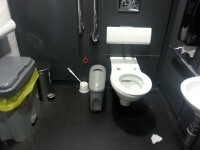 This accessible toilet is located in the right hand corridor, to the rear right of the counter. 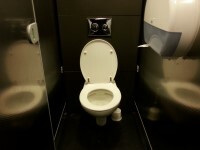 The dimensions of the accessible toilet are 173cm x 213cm (5ft 8in x 6ft 12in). 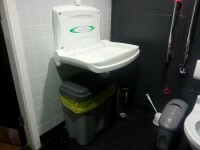 There is a/are female sanitary, non-infectious waste and waste paper pedal bin disposal units. 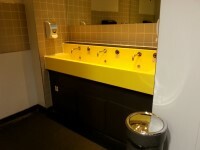 There is a baby change facility within the accessible toilet cubicle. The height of the baby change unit is 90cm. 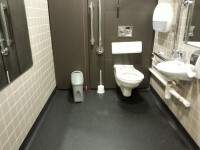 This accessible toilet is approximately 34m (37yd 7in) from the main entrance. 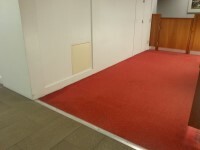 This accessible toilet is located in the rear corridor leading from the foyer area, on the right hand side. 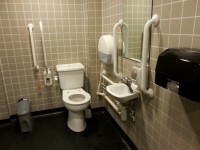 The dimensions of the accessible toilet are 160cm x 207cm (5ft 3in x 6ft 9in). There is an overhead powered hoist within this cubicle. The hoist covers the entire accessible toilet area. The hoist is attached by hook and loop. 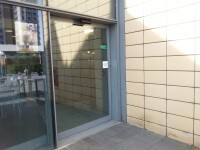 This accessible toilet is located at the rear of the building on the first floor, in the corridor on the right leading from the main foyer. 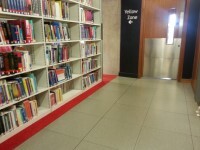 There are identical accessible toilets on the basement floor, second and third floors. 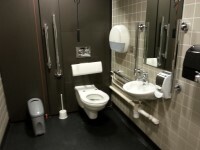 The dimensions of the accessible toilet are 160cm x 256cm (5ft 3in x 8ft 5in). You are on Standard Toilet(s) (Cafe). Skip to the next section. 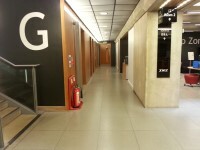 The shared toilets that were surveyed are located in the right hand corridor to the right rear of the cafe counter. 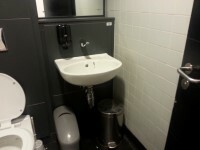 The shared toilet(s) is/are approximately 8m (8yd 2ft) from the cafe entrance. There are 3 unisex toilets and the details are same for all of them. 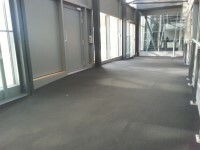 The toilet surveyed is located in the rear right hand corridor leading from the foyer. 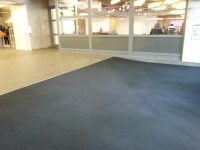 The standard toilet surveyed is approximately 38m from the main entrance. There is a horizontal grab rail to the right of the seat. 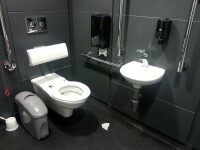 There is sufficient standing space in the cubicle for ambulant disabled people.